Paying taxes and figuring out tax deductions can be tricky, but if you’re self-employed, maneuvering through tax returns can be downright confusing. With the help of tax software*, filing out your 2012 tax returns is easy, but it’s always a good idea to know what rules the IRS mandates as well as a few pointers for the self-employed. You can take deductions on your taxes for a home office, but there are several rules you must follow. In fact, many entrepreneurs typically do not take the home-office tax because of confusion or fear of an audit. According to a 2008 survey by the National Association for the Self-Employed, 60% of home office workers, do not take the home-office deduction. 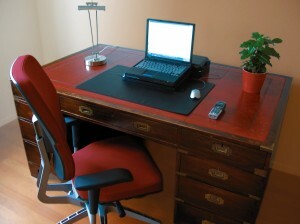 You can only take deductions if your home office is your “primary place of business” or you meet clients in your home. If your gross income from your home business is less than your total business expenses, your deductions are limited. To deduct otherwise nondeductible expenses (such as insurance, utilities and depreciation of your home), you’ll need to take your gross business income and subtract 1) mortgage interest, real estate taxes, and casualty theft and losses that are related to your business and 2) business expenses that related to activity in the home, such as business phones, supplies and equipment depreciation. Beware of deducting inflated sums. Home office deductions are closely monitored by the IRS. Suspicious deductions could get you audited, so make sure that you can back up your claims as much as possible. You’ll need to figure out the business percentage of your home. To get this number, compare the square footage of the space used for business to the total square footage. For example, if your home office is 240 sq. ft., and your home is 1,200 sq. ft., then your business percentage is 20%. The self-employment tax is the self-employed taxpayer’s version of the FICA (Federal Insurance Contributions Act) tax paid by employees to pay for Social Security and Medicare. Because you’re carrying the full burden of paying for Social Security and Medicare instead of sharing the load with your employers, you will be paying more in employment taxes. When employed elsewhere, your employer and you would each pay the 7.65% FICA tax. When you’re self-employed, though, you’re stuck with the full 15.3% tax. When figuring self-employment tax you owe, you get to reduce self-employment income by 7.65% before applying the tax rate. You can also claim 50 percent of what you pay in self-employment tax as an income tax deduction. You will calculate your self-employment tax on Schedule SE and report that amount in the “Other Taxes” section of Form 1040. Keep very detailed records. You need to save all of your documentations and receipts to justify your tax deductions. This includes your gas mileage, utility bill, cell phone bill and more. Don’t forget to keep track of miscellaneous business expenses, including computer repairs or office supplies. Deduct childcare costs. There are allowable deductions for daycare, nanny care, babysitting and any other type of childcare provided while you are working. Take the deductions allowable. The cost of your inventory cannot be written off until sold. But if you have any damaged inventory, inventory that is out of date or unsalable for any reason, you can write it off. Deduct your health insurance premiums, but remember you can’t deduct more than the net income of your business. Lower your tax bill by making tax-deductible contributions to a retirement plan for self-employed individuals such as a SEP-IRA. Save for your taxes throughout the year. You don’t want to be hit with a huge tax bill every spring and have to pay for it all at once. Make sure you’re setting aside 15% of your income throughout the year, so that you’re not in for a huge surprise around tax time.